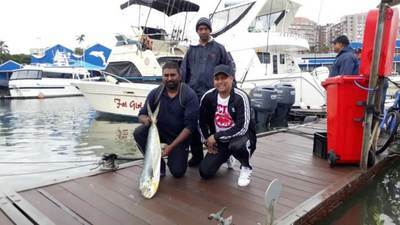 We met our clients this morning in heavy rain and gave them the option to go the next day but they wanted to fish, other than the rain the conditions were very nice and so the short 5hr trip got going at 06h00. We trolled out to the reefs to do some bottoms and hooked a Dorado on the way. Bottoms produced some nice reds. On the way back we hooked into a large Wahoo which really gave a great Arial display before biting through the leader. I am pleased that we are starting to see Wahoo as they have been absent from our waters so far.